As I promised during my campaign for City Council in 2013, I have endeavored to have an open and transparent office that is accountable to you the people. One of the most effective ways was through our monthly email newsletter. As we get closer to the primary elections on September 12, 2017 and the general elections on November 7, 2017 and I begin to run for re-election to the New York City Council, current law prohibits elected officials from sending newsletters to residents, even if they have subscribed to receive them on a monthly basis. The 2017 election “blackout period” begins June 14, 2017, and ends after the elections. During this period my government office will only be able to send physical and digital correspondence specifically related to constituent service, the budget, and events. 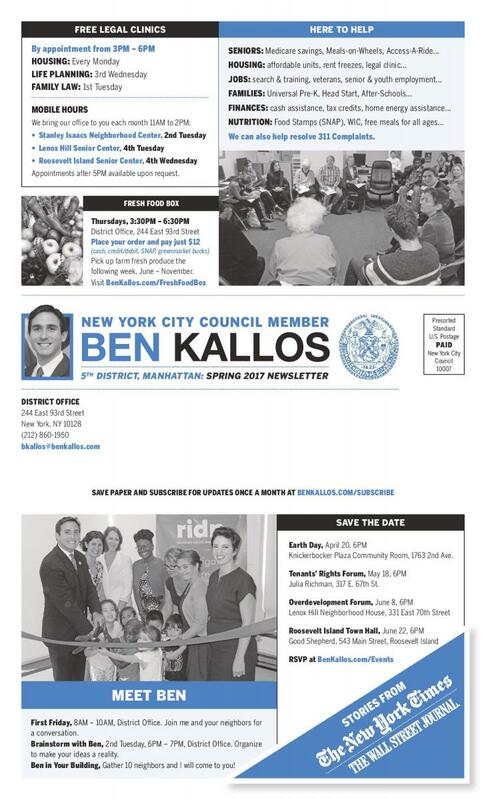 We will still be able to provide news in person at our district office, by phone 212-860-1950, email at BKallos@BenKallos.com, through our website at BenKallos.com and social media so please follow Twitter.com/BenKallos and like Facebook.com/BenKallos. First Friday, 8AM - 10AM, District Office, Join me and your neighbors for a conversation. Brainstorm with Ben, 2nd Tuesday, 6PM - 7PM, District Office. Organize to make your ideas a reality. Ben In Your Building. Gather 10 neighbors and I will come to you! I hope everyone had a relaxing and reflective Memorial Day and for those who celebrate Shavuos, please enjoy the coming days. In May, transportation on the Upper East Side got even better as we kicked off Select Bus Service on the M79 and welcomed a fleet of 79 new buses to the neighborhood. If you've noticed the streets are getting cleaner, it is possible that the 284 new high-end trash cans that my office purchased to blanket 104 intersections in District 5 may have something to do with it. And as you may have heard by now, in April my office led a rally for more Pre-K seats on the Upper East Side. Now, a month later the Department of Education has responded with good news for the neighborhood. I continue to oppose NYCHA’s plan to rip out the Holmes Towers playground to build a 47-story tower with luxury housing, and in May I rallied with tenants to let the city know their deal is unfair. If you dislike unnecessary scaffolding throughout the City as much as I do, the New York Times agrees with us and they editorialized on legislation I have introduced to force property owners to only be able to use scaffolding when it is necessary. The Board of Standards and Appeals (BSA) is a little-known agency that controls exemptions given to developers on how they build in our City. For decades this agency has been used as a rubber stamp by developers to pave the way for buildings communities opposed. Thanks to a package of legislation getting signed into law in May, which included five bills I authored, the BSA will be much more transparent and accountable to the community. This month we will hold a forum to discuss Fighting Overdevelopment on the Upper East Side, as well as a registration event for the New York City Rent Freeze Program, and our annual Roosevelt Island Town Hall. As we get set to welcome summer, my office and the Parks Department have teamed up to bring activities for the community. Whether it is tennis open to the public at the Queensboro Oval, Movie Nights Under the Stars or Skate Night there are plenty of free activities for residents to enjoy as the temperatures increase. Also back by popular demand is Grow NYC’s Fresh Food Box which will kick off at my office on June 15. Cooking with Kallos will also make a return on June 3 at the 82nd Street Greenmarket. I hope everyone has a happy and safe start to summer, and Happy Fathers Day! Thank you to all the parents, teachers, delegates, and the 2,421 voters who made the 2017 Participatory Budgeting process a huge success by voting on how we spend $1 million. And the winners are: P.S. 183’s Science and STEM Lab and the P.S. 198/77 Playground Renovation! This month, we joined Mayor Bill de Blasio in announcing $100 million to add 8 new blocks of parkland and close the gap on the East River Esplanade from 53rd to 61st Streets. We also worked with Speaker Melissa Mark-Viverito to include a request for $169 million in the City Council's preliminary budget response to continue necessary repairs to the Esplanade. I continue to lead the fight for Pre-Kindergarten seats on the Upper East Side, where 300 four-year-olds are being asked to commute out of district as far as the Financial District for Pre-K. In response, parents, children, and elected officials rallied for Pre-K for All to include seats on the Upper East Side. As we continue to fight for school seats, I have been advocating for Universal Childcare for all city children from birth to four, and the city has taken a big step with a plan to provide Pre-K to three-year-olds too. Governor Cuomo announced the first in the nation Excelsior Scholarship for students whose families make $125,000 per year or less, who will now qualify for free college tuition at all City (CUNY) and State (SUNY) two- and four-year colleges in New York State as long as they live in state. When I ran for office in 2013, one of the "fresh ideas" for which the New York Times endorsed me was providing a debt-free higher education for CUNY students. I am proud to support Governor Cuomo's program. Legislation I authored to “Get Big Money Out of New York City Politics” by matching every small dollar got a hearing, a rally, and support from a broad coalition of organizations representing communities of color, immigrants, tenants, preservation, good government, candidates, and regular New Yorkers. In celebration of Earth Day, I joined in the “March for Science” and introduced legislation to make New York City greener by decreasing light pollution, increasing commercial recycling and mandating zero waste by 2030 to make the MTS obsolete. Please join me for First Friday on Cinco de Mayo. I would also like to wish my mother and all the District 5 mothers a Happy Mother’s Day. Thank you to the over 2,000 East Siders and Roosevelt Islanders who voted this March in Participatory Budgeting, contributing to the highest turnout we've had in four years. Results will be announced next month. In March, the City Council begins the budget process with hearings on how the city plans to spend its money in the coming year. I've questioned how we are saving to prepare for potential cuts by Trump, the need for more school seats on the Upper East Side, the rising cost of waste transfer caused by marine transfer stations, and the need for additional funds to repair the East River Esplanade, many of which were included in the City Council's official budget response to the Mayor. New York City faces a homelessness crisis with 22,973 children, 17,548 parents, and 13,913 single adults in shelters, and many more living on the street. Last year, I founded the East Side Taskforce on Homeless Outreach and Services (ETHOS) to help the homeless in our community. 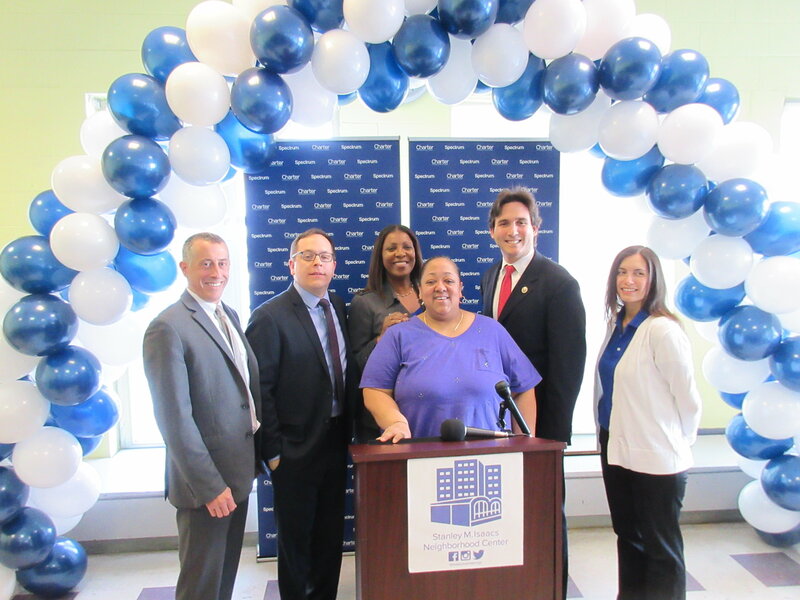 This month I was proud to welcome new supportive housing for women and children with elected officials, community leaders, teachers, parents and even children from the schools across the street. One homeless individual who we believe suffers from mental illness drew renewed attention this month when a community member launched a petition. I have previously worked with the City's outreach teams to offer her mental health services, which she declined. After many complaints, a resident was willing to come forward, making an official complaint, and I personally went with this resident to the 19th Precinct leading to her arrest and her finally accepting both shelter and treatment. If you see someone in need, don't give them money, please call or use the 311 app and contact my office so we can help. March was women’s history month, and I was proud to introduce a resolution in support of building a Women’s History Museum on the national mall in Washington, D.C. In April we will host an Earth Day event with free reusable bags where you can learn what you can do for a greener city. For children in grades five through eight, I am asking "What would you do as Council Member for A Day?" P.S There will be no Brainstorming with Ben in April so that I may instead answer four questions at our annual Passover Seder. Today, over one million low-income youth and seniors now have access to affordable high-speed internet. As of 2015, more than 730,000 households in New York City do not have broadband, nearly 1 in 4 in Brooklyn and 1 in 3 in the Bronx, leaving them on the wrong side of the digital divide. In 2013, I promised to secure affordable broadband for low-income New Yorkers from our internet franchisers. In 2015, when Charter Communications sought to merge with Time Warner Cable, I joined Public Advocate James testifying at hearings and advocating for the Public Service Commission to require any company acquiring Time Warner Cable help bridge the digital divide by providing low-income residents with low-cost high-speed broadband Internet which was secured by Governor Andrew Cuomo and an order of the Public Service Commission. Today, over one million low-income youth and seniors will have access low-cost high-speed broadband Internet. Learn more from the release, the announcement, or coverage in the New York Daily News, DNAinfo, and NBC. Prospective enrollees must clear outstanding debt to Charter/Time Warner Cable/Bright House Networks from previous 12 months and may not have had broadband subscription within 30 days of signing up. We are one step closer to "Universal Broadband" and I will continue to fight until every New Yorker has access to affordable high-speed Internet and no one is left on the wrong side of the digital divide. March marks the beginning of Participatory Budgeting. During this period you have an opportunity to vote on how to spend $1 million in our community. Voting will be available at dozens of Participatory Budgeting voting sites throughout the district and by absentee ballot. Make sure your voice is heard by requesting your absentee ballot today or committing to vote. In February the New York Times covered an Education Committee hearing where legislation I introduced was discussed. My bill would require the Department of Education to report on the number of applications each school receives, how many offers it extends and where students live as well as show where students end up when they leave their neighborhoods to attend school. Many East Side residents are familiar with the Pre-Kindergarten shortage. This legislation would offer deeper insight and transparency into the problem so we can ensure no child is turned away from his or her neighborhood school. We finished off February with a focus on city management, including a Committee on Governmental Operations hearing on how to help residents and businesses avoid getting quality of life violations. As the City Council reviews the Mayor's Preliminary Budget, I will continue to push for performance budgeting to ensure every taxpayer dollar is getting results. Over the last two weeks New Yorkers have made me even prouder to represent this City as they have come out by the tens of thousands, taking action to support everything from a woman’s right to choose to keeping our nation and City open to immigrants and refugees. To stay informed about ways to defend New York City values against the threats of the Trump Administration, sign up to get more frequent messages from me with notifications of upcoming actions (you can unsubscribe at any time). As we make our voices heard nationally, we must reinvest in leading on the local level. In the spirit of community collaboration, it was a pleasure seeing almost two hundred residents at my State of the District event, where I highlighted much of what we have accomplished together over the past three years, and what we can achieve on the East Side and in New York in 2017. We continue our push to bring true Universal Pre-K to the East Side and Roosevelt Island, to fight against overdevelopment, and to bring scaffolding down throughout the city. We are also taking action to support women's health, fire safety, and construction safety. How will you get involved this month? Happy New Year! Your gift for the holiday season and surviving nearly a decade of construction is a brand new Second Avenue Subway. On Sunday January 22, I will be hosting my annual State of the District event with FREE reusable bags at Memorial Sloan Kettering and everyone is invited. At the State of the District, I will be discussing the busy year my office has had and highlighting some of the victories we have accomplished with our many community partners. RSVP to reserve your bag. In December we continued to fight for responsible development. I introduced a bill aimed at fighting the proliferation of scaffolding by limiting how long it can be up without work being done or completed. The battle to rezone the Sutton area continued in December as the community and elected officials submitted the rezoning application to the City. As the property was sold at auction to the original lender, the race to rezone continues. At 180 East 88th Street we submitted a zoning challenge to force the developer to follow the zoning laws. We are even reclaiming public park land from a private use and need your opinion on what the park should look like. As I continue to fight special interests I am proud to have passed laws to open up the deed restriction process and improve our campaign finance system by stopping public dollars from amplifying the voices of special interests doing business with the city so that public dollars only amplify the voices of voters like you.